The 1980s, a decade I never got to experience but one I think I would have liked. I mean, who wouldn’t have had fun in a decade that accepted some very alternative outfits and rather questionable hairstyles, mullet immediately springing to mind. But the main reason for my 1980s appreciation is because it was significant for cars. The decade saw the growth of the hot hatch and and high performance saloon markets, creating some of the most iconic cars in recent motoring history. It was clearly an important decade, not just for barnets, but for motor industry too. Having not lived the 1980s first hand, I often think I’d love to own one of the classic examples of car it produced. Unfortunately, for me and other fans, anyone seeking to own a classic may soon come unstuck in their hunt. Many of those Peugeot 205 GTIs were reverse parked into hedges at high speed and clean E30 BMW M3s cost more now than they did new. So if you’re hoping to drive a desirable car from the 1980s, you may find yourself short of options. 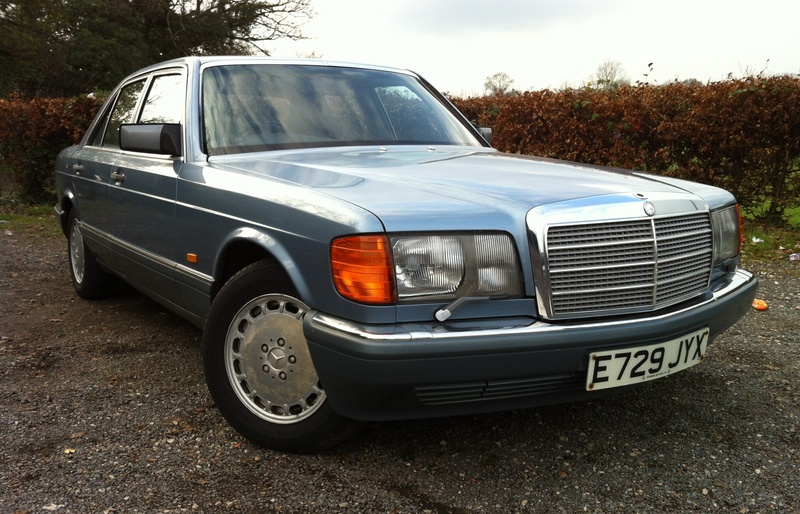 Nevertheless, one bitter January morning, I was handed the keys to a certain E registration Mercedes-Benz; a Diamond Blue, 1987 300 SE to be exact. Given that this car is over a quarter of a century old and bearing a certain three-pointed star emblem, I was naive to think it would devoid me of a significant wad of cash. However, I soon learned that this car could be bought for less than a four year old Fiesta, or under £5000. Had I come across the bargain luxury barge from the 1980s, or just an old banger? 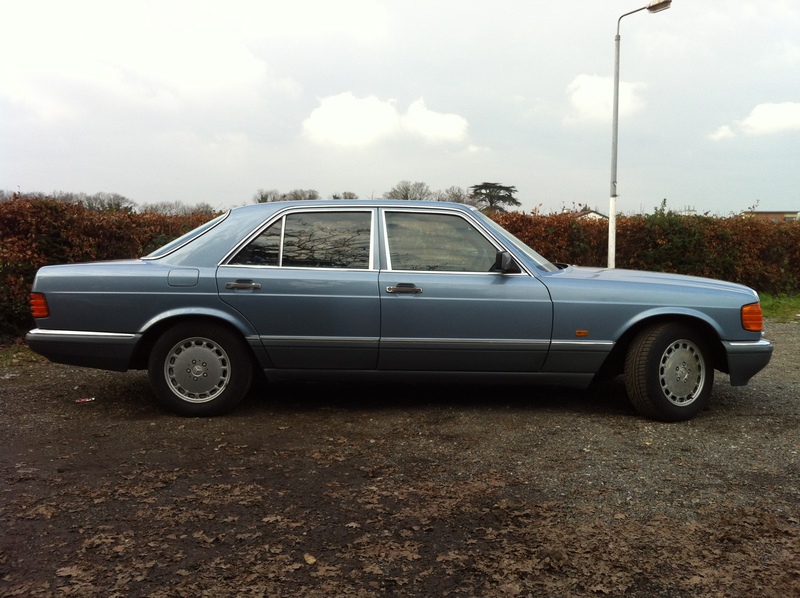 Walking up to the Mercedes, that classic W126 S-Class shape was immediately evident. A large chrome grill followed by a long bonnet and straight lines, remained true to the previous generation’s design. Unfortunately, our car had lost its bonnet emblem (probably now part of a pre-adolescent’s ‘shiny things’ collection) but aside from this it was impeccably clean. This car oozed class but thanks to its simple lines and classic style, managed to remain almost understated, in spite of that enormous grille. Slipping into the cabin it became clear just how immaculate this car was. Despite 26 years having passed since this 300 SE rolled proudly out of Stuttgart, it seemed as though it had barely been used. 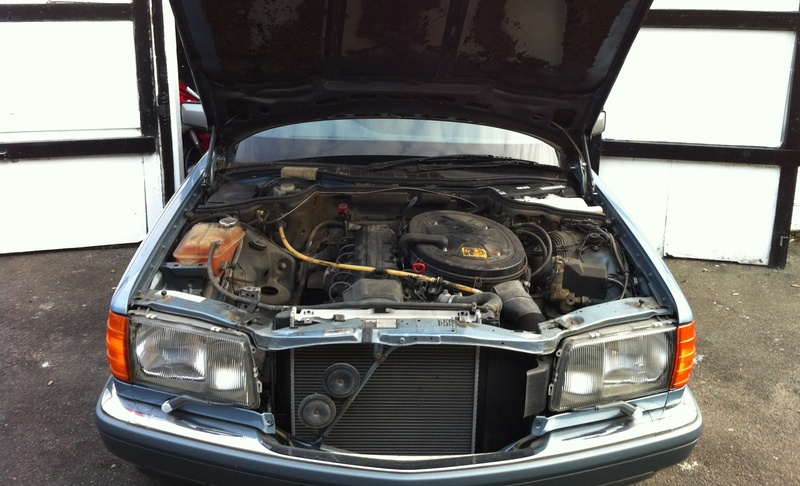 Of course it’s one thing to keep a car looking good, quite another to keep it running healthily. As I turned the key the six-cylinder engine instantly fired into life, shrugging off the near freezing conditions. Even my far younger RenaultSport Clio had turned over two or three times before starting that morning, so I was already impressed. 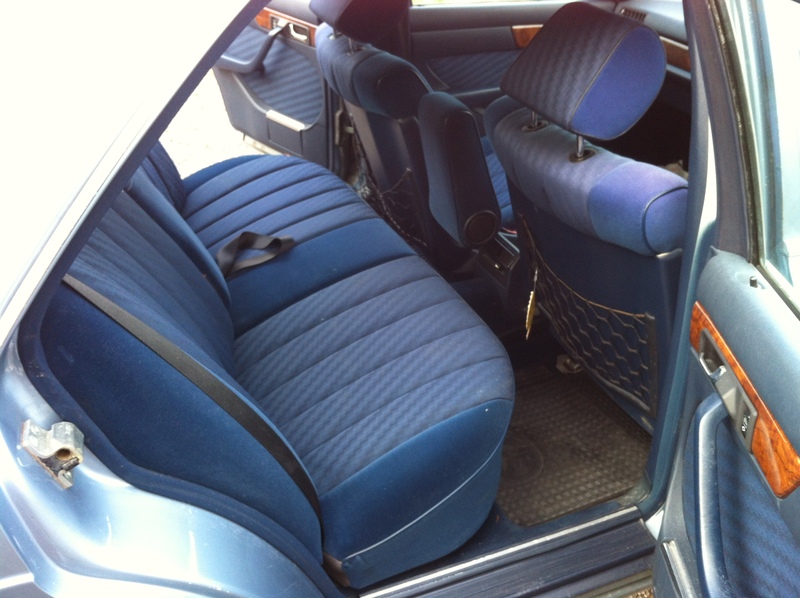 Looking across at my surroundings, I noticed how typically 80s the interior was. Lots of plastic and fabric seats ensured this cabin wasn’t a Bentley beater but straight lines, sharp angles and dark wood panelling added a regal touch to this majestic saloon. 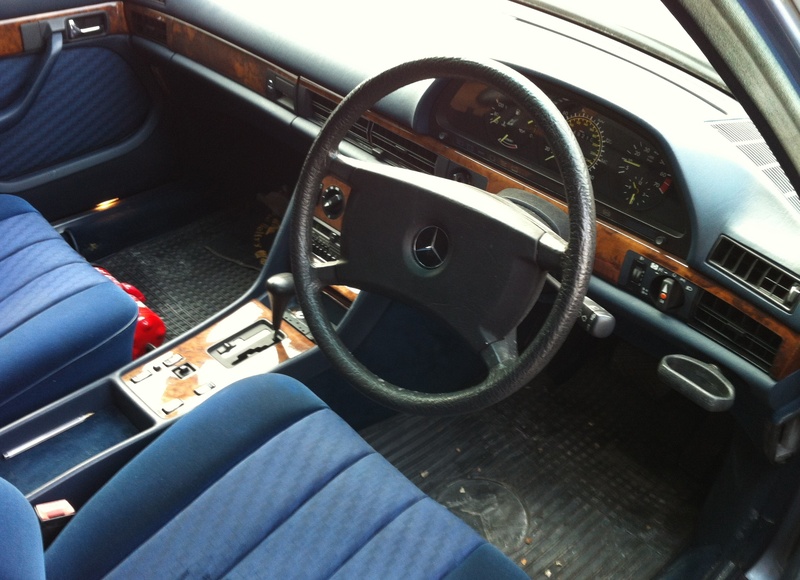 The steering wheel was large with a sizeable centre boss, proudly displaying the Mercedes-Benz emblem. It wouldn’t have looked out of place in one of Benz’s trucks. Modern S-Class owners are able to rely on an abundance of active safety systems to save them from any ‘moments’. Our ’87 example however, featured a far more passive approach. The SE came with a fire extinguisher (an optional extra at the time), as well as a first aid kit. So if you were about to crash, at least you knew you could put out a fire and rub some cream on associated burns. 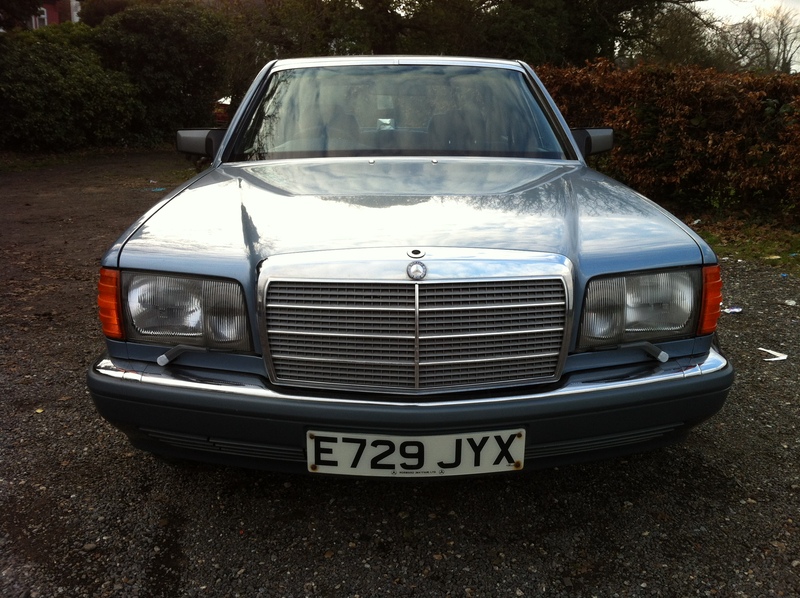 Not exactly confidence boosting but for its time this Merc was one of the best choices for a safety conscious buyer. Seeing as how this car had already shown much potential, it was now time to take it for a spin. Rolling up the sleeves of my shell suit, I turned up the volume of Duran Duran’s Rio and clicked the gear lever into Drive. In reality, I turned up the heating and switched off the radio – I wasn’t going to let Flo Rida destroy this classic. The engine in our 300 SE was the entry-level 3.0-litre straight-six; top end models featured anything up to a 5.6-litre V8. Whilst our six might not have possessed the might and overwhelming grunt of the V8, it was more than useful and seemingly able to utilise all of whatever remained of its original 185 German horses. In fact, the engine’s power and torque delivery gave for a very smooth driving experience. Coupled with a steady but smooth-changing automatic gearbox, this engine responded in a relaxed, yet dutiful manner. The 300 SE’s chassis set-up was very soft, allowing this 1.6 tonne saloon to glide over bumps and potholes. Of course, this comes with a compromise, with agility suffering as a result of substantial body roll at less than sensible speeds. Carry plenty of velocity into a corner and you’d find yourself faced with a much more literal example of ‘driving on the doorhandles’. But this 300 SE was never intended to be a sports saloon so driving it like one would defeat the point. Instead, this car was designed to carry its well-heeled occupants in comfort and with ease. And that’s one of the best things about this car, it can still do what it was designed to do 26 years on. For this reason, I think instead of being something to buy as a classic, I think it is actually something you could buy to use everyday. For someone looking for a comfortable saloon, it provides a far more interesting alternative to your Vauxhall Insignias and Ford Mondeos. With a generous boot and plentiful cabin space, it is a useful tool in carting around the family. And that 3.0-litre engine is a fine example of German engineering, meaning you’ll rarely have to worry about reliability issues. Our 300 SE had only covered just shy of 50,000 miles but we were confident it could easily see out another 100,000 at the very least. The £220 annual tax and about 30mpg means this car isn’t a cheap run about but for that extra 1980s prestige with added exclusivity (fewer than 800 300 SEs remain on UK roads), this car could be an out of the ordinary choice. One thing’s for sure, you’d look much cooler in your big old Benz than a modern repmobile.